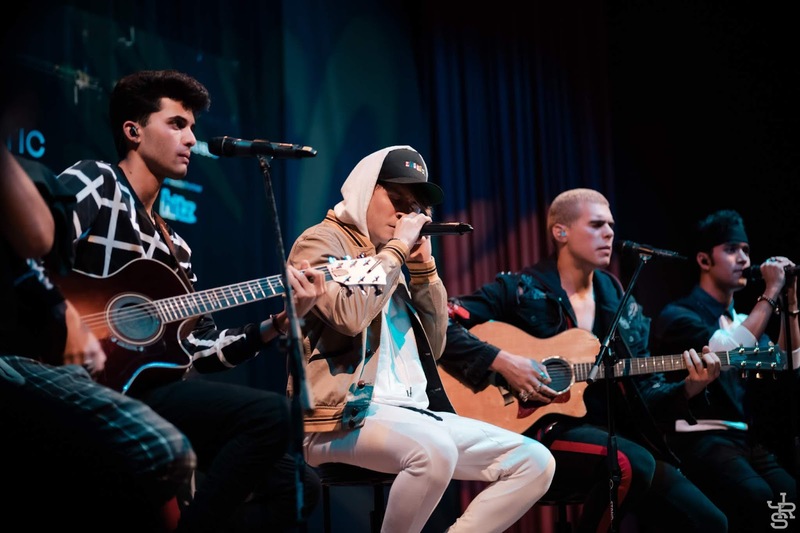 Latin Boy Band, CNCO Serenades Their Way To Asia! Bringing the heat to Malaysia with Latin's hottest boy group – CNCO made their way to Asia for three months for a special promo tour, ending with Malaysia as their last stop. Fans were able to get up close and personal with CNCO by winning meet and greet passes and tickets through Sony Malaysia and Hitz.FM. With opening acts by local artists - Insomniaks and Aisha Retno! The boys started the night with an acoustic rendition of “Mamita” from their second album. Member Zabdiel and Erick along with the vocals, provided the tunes to this acoustic live showcase. Malaysian fans sang along passionately, bringing forth CNCO’s ability to reach different parts of the world with their music. Followed on with - Sólo Yo, Hey DJ, Se Vuelve Loca and ending with the chart-topping hit - Reggaeton Lento. In addition to their live performances, CNCO was not afraid to dip their toes into a different culture. They came back on stage wearing a traditional Malaysian male attire, sending screams across the crowd. The boys also danced in their Malaysian attire, it was no secret that the fans loved it! Get to know CNCO a little bit more with our interview with them! 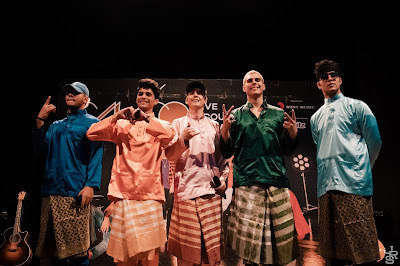 He then talked about how they put on a “Baju Melayu” and that the fans went crazy for their new look! They were surprised and utterly pleased with the fan(s) reaction. Christopher shared his funny moment on stage when they were saying bye to the audience, he was holding a camera. As he said 1,2,3 – the “samping” from the “Baju Melayu” fell down. He felt embarrassed but mentioned it was a fun time! What’s the difference between Asian fans and the ones back home? Richard : "Asian fans are super respectful, we love how kind and tender they are. We were told that they are shy and quiet but when we went on stage, they were loud and it reminds us of our countries. It’s still cool that they still had a “CNCOwner” thing. It’s like a special thing that our fans have. We hope to come back with a tour and perform all of our songs." Christopher reveals that they struggled a little with communication when the group first formed as he explained that although everyone in CNCO speaks Spanish, there are some words, nuances and accents that's different. However they managed to learn from each other as he jokingly mentioned now it's like a "CNCO language". CNCO has released two albums within the past three years with Primera Cita (2016) and CNCO (2018). Richard mentioned their newly released album is very different compared to the first album because of the lyrics and type(s) of melodies. Additionally, the boys were much more involved in this album. They wrote 2 songs - Bonita and No Me Sueltes. The boys are proud of this album, stating it's like a sneak peak of what's coming of the group. It's no secret CNCO is well known for Latin pop, but we asked if they are open to tackle on a new genre. The boys states they want to try everything from K-pop and even a genre here in Malaysia but never lose that Spanish touch. Joel revealed that they are currently working on a lot of English music and collaborations. Joel : "We actually did a remix of Mamita in Portuguese so we’re open to do anything with any language. We’re always maintaining that Latin influence in our music even though we’re singing in different languages." What do you want the public to remember CNCO 30 years from now. Richard : "We want them to remember our music, that’s the mark we are trying to leave. Between our music and our culture, we want to spread that all around the world. And also, to the youth, they could accomplish anything they want. Chasing the same dream, we are all from different countries so music united all of us. We want to mark in our name, that no matter where you’re from or what you do, if you want to accomplish something just dream and never stop working for it. God has everything planned for everybody." Ending the interview, Christopher leaves a message for the Malaysian fans, "We love you guys a lot, we love everyone with all of our heart, Malaysia thank you for your kindness, and we are sending hugs and kisses to everyone. And thank you guys again for all your hospitality, we care for you."